I'm a media researcher and cultural producer. I was born and raised in Tel Aviv, lived in Baltimore for many years, and then moved to Amsterdam with 2 cats. Additionally, Cornelius maintained a project-specific Twitter account on which she tweeted both event updates and (presumably) dramatized posts documenting her preparations for the big day. These again highlighted the absurdity inherent within wedding preparations such as weight-loss attempts and the use of hashtags like #Bridezilla. The artist received a range of proposals, all posted on the project’s Tumblr blog. The majority of proposals were text-based, many including poetry. A few proposals utilized other media such as a song performed on YouTube. I have been aware of Kathryn Cornelius and her work for some time. She performed her piece Recognition at ArtDC, an international art fair at which I worked, and participated in a few projects with my former professor and all-around art hero Jeffry Cudlin. As a member of the DC arts community and as a young woman questioning the construct of marriage myself, there seemed to be too many points of happy coincidence to not try my hand at a sham marriage with the artist. I created a short piece, my first wedding proposal, submitted it, and awaited the results. One day prior to the proposal submission closing, I received an email from the artist notifying myself and the other “suitors” of a change of plan. Rather than make her decision and have the public vote on whom she should marry based on our proposals, Cornelius decided to add a new component to the project. She now wanted each participant to answer a series of 10 personal questions as well as to submit a headshot, which she would then post on the work’s blog. She and the public would now make their selections based on these “dating profiles” rather than on the proposals themselves. This turn of events was disappointing, both personally and within the context of the work. While I had no problem being evaluated on the merits of my video, I did not feel comfortable subjecting myself to public approval on the basis of my appearance or personal tastes. Had this aspect been included from the outset, I would not have submitted a proposal, and I found it questionable that the scope of required participation was changed midway through the project. I communicated my discomfort with the artist, but was met with the response that I should utilize this new component “as an opportunity for personal growth.” Finding this argumentation to be rather problematic, I made the decision not to submit my photo and answers, realizing that I would most likely not participate in the piece as a result. Cornelius made her selection of 6 suitors, and I was indeed not included among them. She then utilized the project’s Facebook event page to post a poll for public vote on the seventh suitor, and I amusingly ended up in the third place despite my conspicuously absent dating profile, and so I was satisfied with the result. 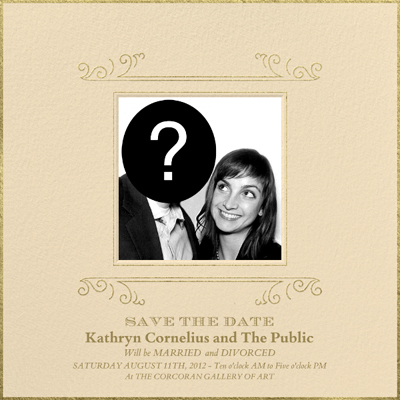 The artist continued to blog and tweet about the project including subsequent “first dates” and “engagement photos” with the suitors, elements that were also absent from the original project description. The seven weddings were ultimately streamed through Livestream. Despite not fully participating in this piece, I am happy to have engaged with it. The work highlighted the potential problems surrounding the use of social media by artists in tandem with their work. Cornelius’s additions of the dating profiles, first dates, etc. were clearly designed to self-promote and raise hype, thus blurring the boundaries between the work of art and the complex institutional and commercial frameworks within which it operates, between artist and marketer. The project also raised a number of questions for me with regards to participation-based performance art. It led me to consider issues of consent, and the power dynamics between artists and their volunteers in these types of works. While Cornelius maintained ultimate authority, she would not have been able to realize her piece without willing participants.